Ah, to be 18 again. A skeleton with no aches, the ability to deplete whole pantries of food without adverse effect, the optimism of seeing all your best years before you, and a lifetime 5-0 record against top-20 players in professional tennis. Fine, maybe that last trait is unique to Félix Auger-Aliassime, the lank prodigy chopping up the competition in effectively his first full season at the ATP level. With Wednesday’s 7-6(3), 6-2 win over No. 11 seed Borna Coric, Auger-Aliassime became the youngest-ever semifinalist at the Miami Open. He played through two qualifying rounds just to make the main draw at this masters event, and has now climbed up to No. 33 in the live rankings. The Canadian is not going to have to qualify for anything much longer. He’s cementing his stardom, rushing the product ahead of schedule. Coric is a 22-year-old in the Djokovic mold, with lots of defensive gifts and the talent to beat Federer twice last year. He’s been lurking on the fringes of the top 10 despite struggling to maintain his top level over the course of a season, or even a single match: Of his last seven matches against lower-ranked players, six went to a deciding set. 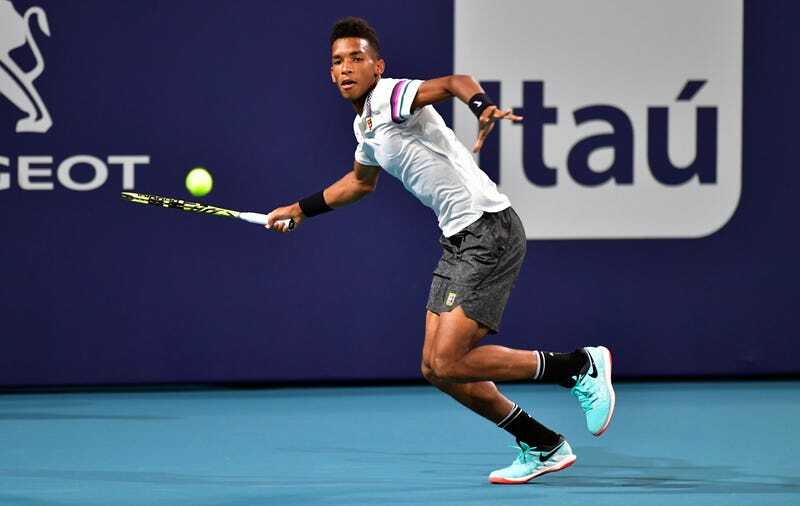 But his third-round Miami defeat of a relatively engaged Nick Kyrgios brought all that ridiculous defense to the fore, so he was looking renewed and worthy of his rank going into this matchup against Auger-Aliassime. Early on, Auger-Aliassime flashed the all-court craft that would eventually blow this match open. This was an incredible return into the far corner, followed up by a judiciously weighted approach shot. That’s been FAA’s defining trait thus far in his early career: He knows exactly how much sauce to apply, even in situations where a young player might swing for the fences. He knew this shot wouldn’t be an outright winner, but trusted himself to establish good position at the net by the time he needed to reply. That dead-on-impact drop volley is just gravy. The two would exchange breaks before the teen took the first set in a tiebreak. Here Auger-Aliassime applied much of the same formula as before—firm but patient approach, faith in his quick hands—this time on his own serve. It’s note-perfect hard court tennis. The Croatian at his best is a steady Pong paddle from the baseline, but Auger-Aliassime complicated that by closing down the net and taking away the time he needs to slide around for his retrievals. By the second set, Coric was no longer at his best anyway, and Auger-Aliassime asserted himself as a different caliber of player. How Many Seconds Of Denis Shapovalov&apos;s Rap Can You Tolerate?